Sea ice formation, evolution and motion present several challenges to climate modellers. 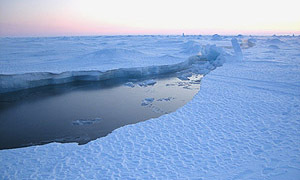 As sea water freezes, a thin layer of ice forms. The ice can thicken in places due to wave action to form small plates of "pancake" ice, which group together into larger ice floes. Large rigid sheets build up as the ice thickens. New ice typically reaches a thickness of 30-100cm in its first year. If it survives the summer melt it becomes multi-year ice, typically 2-4 metres thick. Wind and ocean currents can lead to areas of compression, divergence and shear. In areas of compression, rafting can occur as sheets of ice over-ride each other, building up ice ridges up to 20 metres thick. In areas of divergence, ice-free water can open up, leading to heat loss from the ocean and fresh ice formation if it is cold enough. Areas of shear stress can produce long "leads" of open water, up to 100km long but only a few hundreds of metres wide, with the ice on either side moving at different speeds or even in opposite directions. This sometimes disjointed motion of the ice is in contrast to the more smoothly-varying motion fields of air and water in ocean and atmospheric models. The width of leads is often below the scale of climate model grid cells, making their influence difficult to represent. It is a measure of how poorly these features are represented that models attempting to represent ice motion often have widely differing outputs compared with each other and with observed ice motion. Today's climate models use observations of physical parameters such as temperature and humidity to fine-tune their performance. The gross performance of a climate model may be assessed by seeing how it compares with today's observed climate data and that of the recent past. Over the open ocean, Earth-observation satellites are the only source for repeat observations over an entire basin and a long time period, and these satellite observations are increasingly used as an input to, and a check on, global climate models. As the spatial detail of climate models improves, they need more detailed observations, capable of representing smaller features, as inputs.